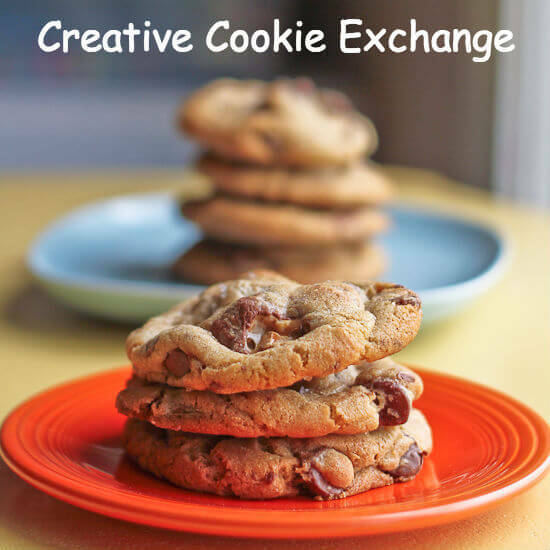 I absolutely love bake sales so I knew this was a great theme to jump back onto the Creative Cookie Exchange. You know what else I love. Food that comes with history! So Anzac stands for Australian and New Zealand Army Corp (ANZAC). According to popular culture, these cookies first became popular in World War I when wives wanted to send their husbands serving in the army some sweet treats . The ingredients in these dont spoil easily and the finished cookies travel well. And because of this and the fact that money was in short supply, there are no eggs in these either! History aside , I think Anzac cookies are a good option for bake sales for exactly the same reasons !Because one- they are simple to make , two – they give an option to people who want to try something different (ofcourse , favourites will be favourites!) , three – they stay good for about a week and four – the biggest reason is because they are DELICIOUS ! They are full of crunchy oats , tasty coconut and some honey (recipes call for golden syrup but i never have golden syrup in my pantry). Just wait until you get a whiff of your kitchen when these are done baking ! Chewy Anzac cookies full of oats, coconut and honey ! Preheat your oven to 180 C/ 350 F. Line a baking sheet with parchment or butter well. In a saucepan , heat the butter and honey together on a low flame until melted. Meanwhile, mix the baking soda into the boiling water. Mix this into the butter and honey mixture (it may turn foamy). Now mix the dry ingredients in a bowl - flour, oats , coconut and sugar - until well combined. Add the butter honey mixture to this dry mixture and stir until it comes together. It wont be a smooth dough. Take tablespoons of this dough , shape into a round ball and place on the prepared pan. Let there be 2 inches space between the cookies. Bake at 180 C/ 350 F for 12- 15 minutes until well browned . Turn the sheet front to back after about 10 minutes of baking . Cool on pan for 2 minutes and then completely on a wire rack. This recipe gives 25 small cookies. The cookies can be stored in an airtight container for upto a week. I bake my cookies in my Morphy Richards 52 litre OTG with both rods on . I just adore the colour on these ! These ANZACs are crispy outside and wonderfully chewy when you bite in. Just sweet enough and really big on flavour. Did you know that Septemeber is #ChildhoodCancerAwarenessMonth ? A cause that needs your support in any and every way possible. Read up about OXO’s #CookiesForKidsCancer program . I love it when a cookie comes with a story behind it. These sound delicious and perfect for a bake sale! I have always wanted to try ANZAC biscuits–clearly I have no excuse not to now, recipe right in front of me. Great choice for a bake sale! As an Aussie I can tell you that I have eaten many ANZAC Biscuits over the years. ANZAC Day, April 25, is a very special day for Australians and New Zealanders to remember those who fought for our freedom – Lest We Forget. Golden Syrup is a pantry staple for me, even living in the US, but using honey is a great substitute. Your cookies look absolutely delicious.